Erik Denmark and Sarah Reinecke discuss their victories in the Nathan's qualifier at the Bite of Oregon in Portland in the latest Fink Beats the Stomach podcast. The Nathan’s qualifier at Bite of Oregon in Portland is underway. Someone ate 14 hot dogs in the first 3.5 minutes. In the women’s contest Sophia DeVita will face Marlene Wigginton, who took a year off for pregnancy. This could leave the Naperville, IL women’s qualifier wide open if Sophia DeVita wins. Erik Denmark is the only male entrant who has been mentioned. George Shea mentioned the controversy from his last qualifier in Washington, DC where he was accused of putting a hot dog in his pocket. Joey Chestnut will be in attendance and serve as the judge. On twitter, Juan “More Bite” Rodriguez accuses Erik “The Red Denmark” of “Pocket Dog Gate”. 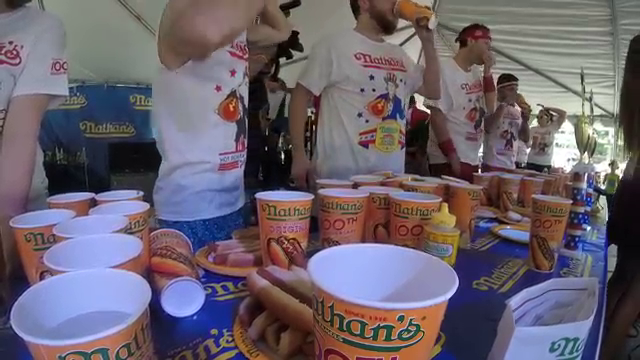 While Carmen Cincotti’s video shows Erik Denmark inserting his hand in his pocket immediately following the Nathan’s Washington, DC qualifier (around the 14:20 mark), it is not 100% clear if he had a hot dog in his hand. Denmark was credited with 32 hot dogs for the contest, which edged out Steve Hendry by one hot dog for the wild card. update Apr 26 Las Vegas Sun has a report listing Michelle Lesco’s hometown as Las Vegas. Rich LeFevre and Barbara LaBarge appeared on KTNV yesterday. update April 28 Crazy Legs Conti has a contest report. Sean Brockert was a judge. Miki Sudo, Nate Biller, Erik Denmark, Yasir Salem and defending champion Crazy Legs Conti are expected to compete. Gideon Oji will make his non-qualifier debut. Crazy Legs Conti appeared on WFLX Friday morning. update Erik Denmark reportedly won the men’s contest. Mary Bowers appears to be the sole female. Today’s Nathan’s qualifier in Houston is abou to start. Erik Denmark, Nate Biller, Juan Rodriguez, Bam Martinez, Alex Perez and Mary Bowers are expected to compete. Ribfest Chicago announces that Erik Denmark will be the only returning pro competitor from its 2012 eating contest, which might be a record for year to year turnover. A full list of 2013 competitors is available on the festival website. 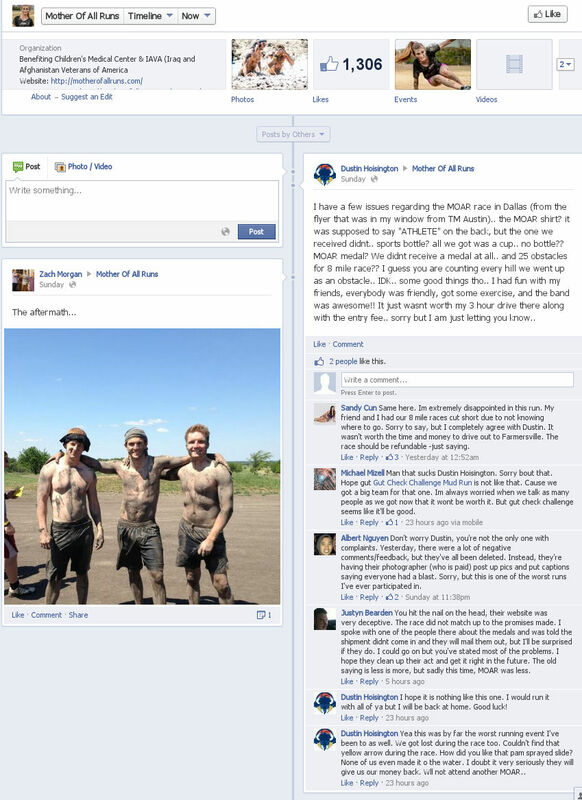 update May 14 There has been a lot of criticism about the event posted on its facebook page which is being deleted instead of addressed (Screen capture of removed post by Dustin Hoisington . Marco “Mongo” Marquez is at the qualifier, which would be his first MLE contest since the Isle Black Hawk Rocky Mountain Oyster Eating World Championship in 2010. Erik Denmark is interviewed in Gulp: Adventures on the Alimentary Canal, a new book by Mary Roach. Other people mentioned in the competitive eating section of the book include Tim Janus, Takeru Kobayashi and Ben Monson. Erik Denmark announces he will be competing in Saturday's Nathan's qualifier in Las Vegas. The dLife segment about how Erik Denmark copes with diabetes originally televised on CNBC in 2010 is now available on youtube. Former Seattle Sonics center Jim McIlvaine finished an 80 ounce steak at Ward's House of Prime in Milwaukee that will be named "The McIlveighty". Erik Denmark provided advice. Klipsun Magazine has an article about Erik "The Red" Denmark focusing on his training techniques. He says he incurred a $5,000 credit card bill for competitive eating related travel in 2006 which took five years to pay off. update Winners have been announced More results (Part 1 | Part 2) Erik Denmark says Damon Wells ate 23.75 HDB. Michelle “Cardboard Shell”‘s appearance on KPHO yesterday to promote today’s Nathan’s qualifier at Arizona Mills can be viewed online. Erik Denmark, Damon Wells, Ron Koch, Kobi Bauer, Steve Hendry are also expected to compete. The contest will take place at noon Arizona time (3 pm eastern). Erik "The Red" Denmark's first new blog entry in almost two years describes his summer plans, which includes working on the Glutton Force Five food truck at the Chicago Ribfest. Results are available on the contest result page. The top Thai, Chotiwit Niwatdechbordin (138), was just two behind Crazy Legs Conti’s total (140). The top four male & female Thais got to compete in the finals next week. Johnny Wu, who has previously competed against Takeru Kobayashi and Sonya Thomas, led the first round of the CP Biggest Eater Hong Kong qualifier with 98 wontons. 54 year old Wang Wenyu led the women with 72 wontons in her first eating competition. Joey Chestnut, Erik Denmark and Juliet Lee will compete in an exhibition held during the second round of the qualifier on November 27. Ken Hoffman of the Houston Chronicle served as Erik Denmark's judge in the 2011 Nathan's finals. Unlike last year when he judged Juliet Lee, he reported an amount the same as the official result (33.5). Don Sturdy has a profile of Erik "The Red" Denmark. update Jun 13 The Phoenix New Times has a gallery and report. update Jun 12 Fox 10 and ABC 15 have articles and videos. update 4:21 The contest is under way. Joey Chestnut’s 59.5 hot dogs in 12 minutes at Arizona Mills in 2007 is still the all time best qualifier result. The contest should start at 1 pm Mountain Standard time, 4 pm eastern. The Phoenix New Times has an interview with Erik "The Red" Denmark about Saturday's Nathan's qualifier at Arizona Mills in Tempe. Denmark says he is considering writing a book about his competitive eating experiences. East Valley Tribune reports that Erik "The Red" Denmark will compete in the Nathan's qualifier at Arizona Mills in Tempe on June 11 along with Ryan McKillop, Ron Sirard, Brian Jacobson and Chiun "Jimmy" Peng. Michelle "Cardboard Shell" will headline the women's division. Posts © 2005-2019 ojrifkin · Original design by Beccary · Sponsored by Weblogs.us · XHTML · CSS 18 queries. 3.894 seconds.